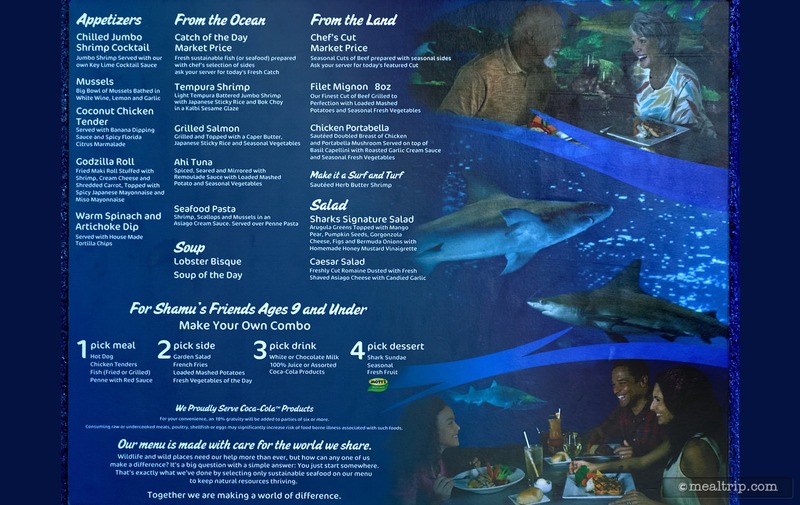 The Sharks Underwater Grill listing is a Table Service (wait staff) dining location at SeaWorld Orlando featuring Seafood and American cuisine. There are 19 photos in the Mealtrip photo gallery for this location and dining period. 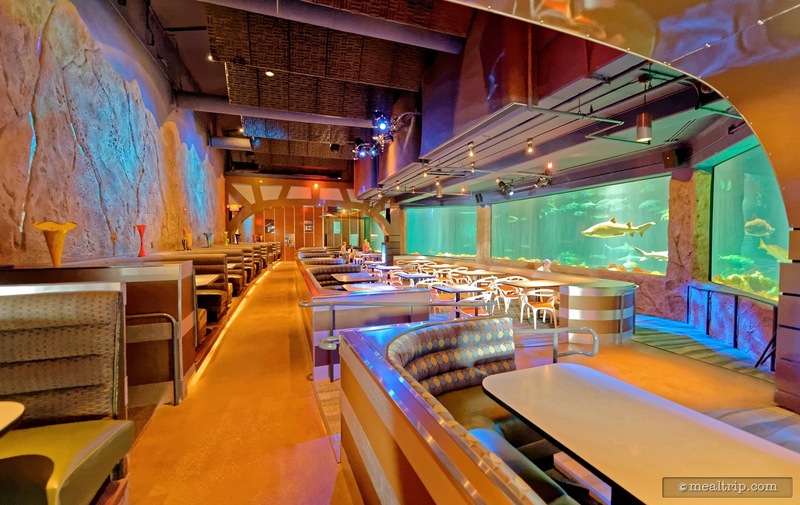 The Sharks Underwater Grill listing currently has a score of 32 out of 100. 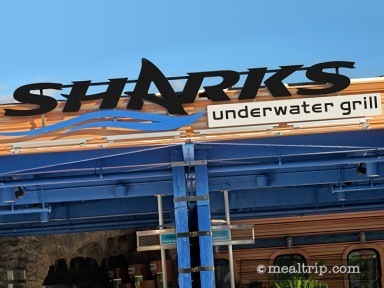 Click here to read all of the reviews for this location, or log in to Mealtrip.com to add your own review for Sharks Underwater Grill. 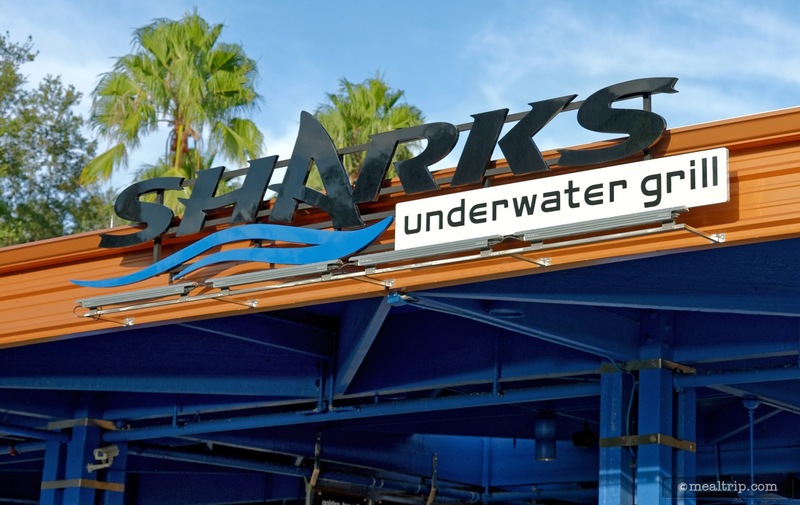 The main location sign over the entrance of Sharks Underwater Grill. 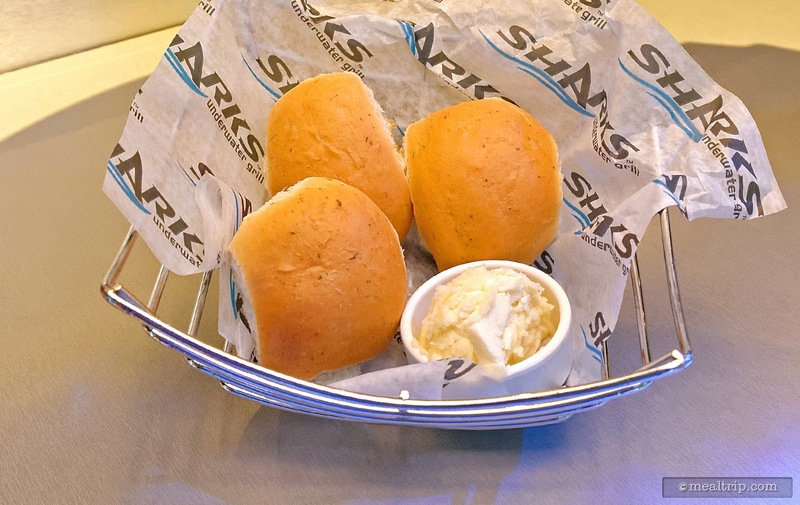 Sharks® Menu (photo taken Fall 2017). 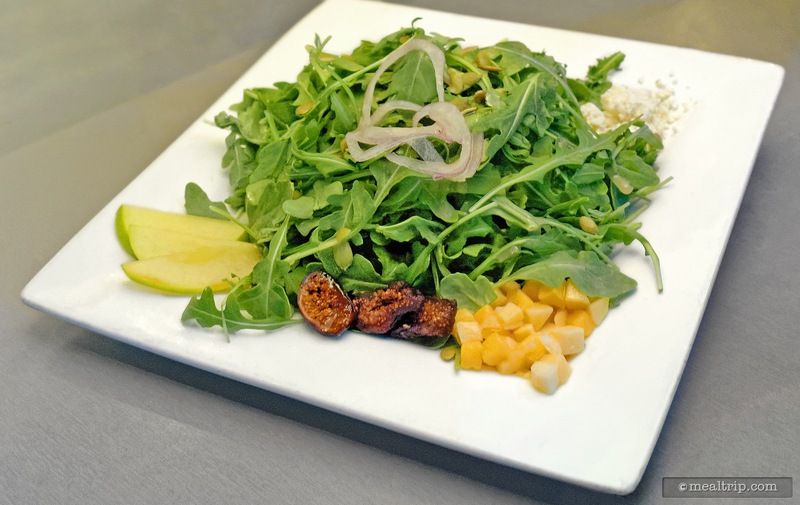 Sharks Signature Salad contains arugula greens with mango, pear, pumpkin seeds, gorgonzola cheese, figs, and onions with a house-made honey mustard vinaigrette. 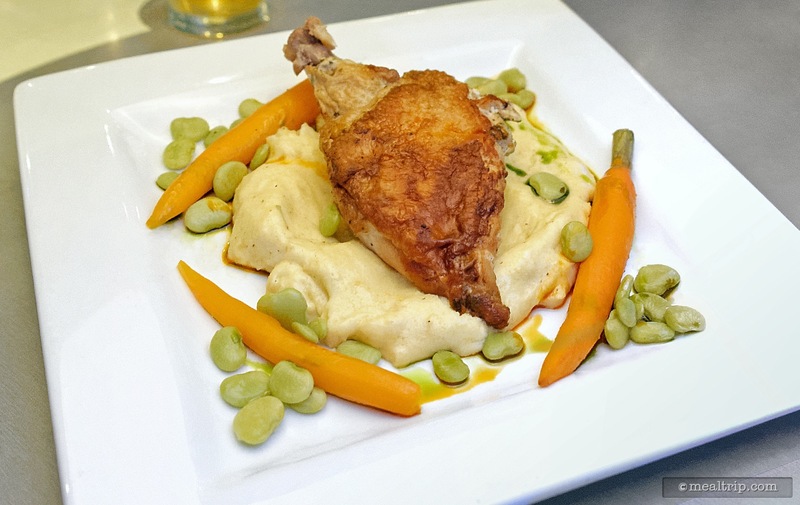 From the Land section of the menu, the Stuffed Chicken entree. The chicken is stuffed with copped spinach, herbs, and cream cheese. The dish is accompanied with cheesy polenta and seasonal vegetables. 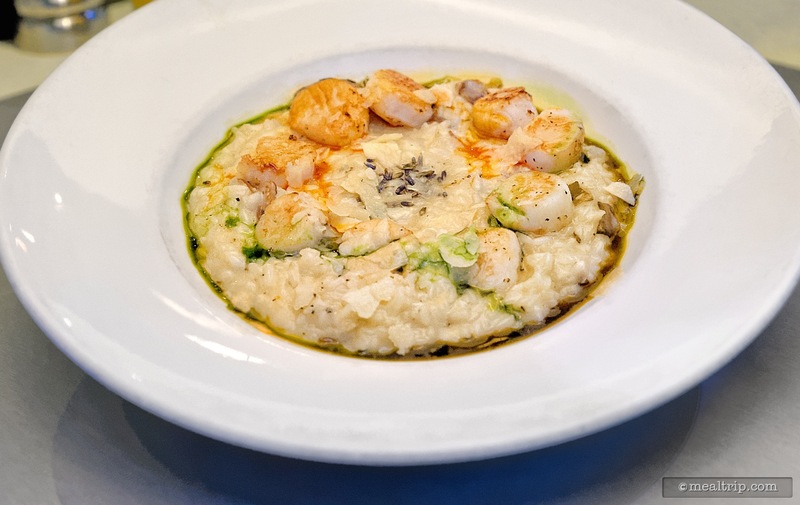 From the Ocean section of the menu, the Wild Mushroom Scallop Risotto includes lavender dusted sea scallops served with a wild mushroom risotto, topped with shaved Asiago cheese. 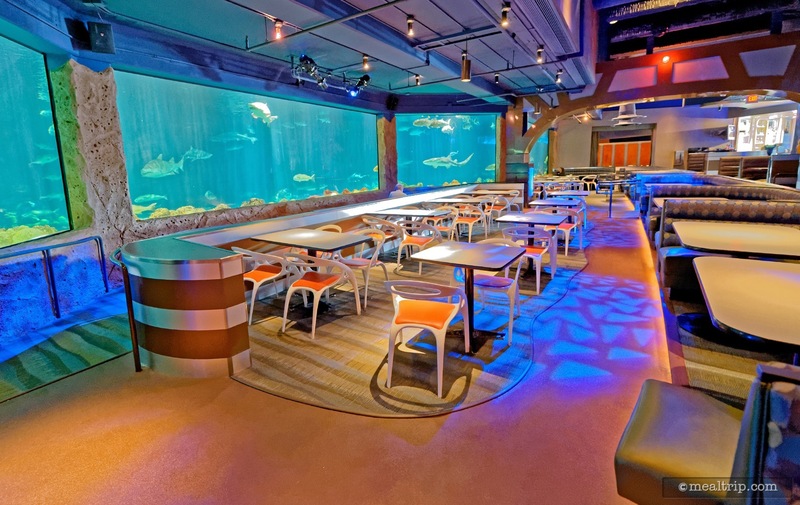 The outside waiting area at Sharks Underwater Grill. 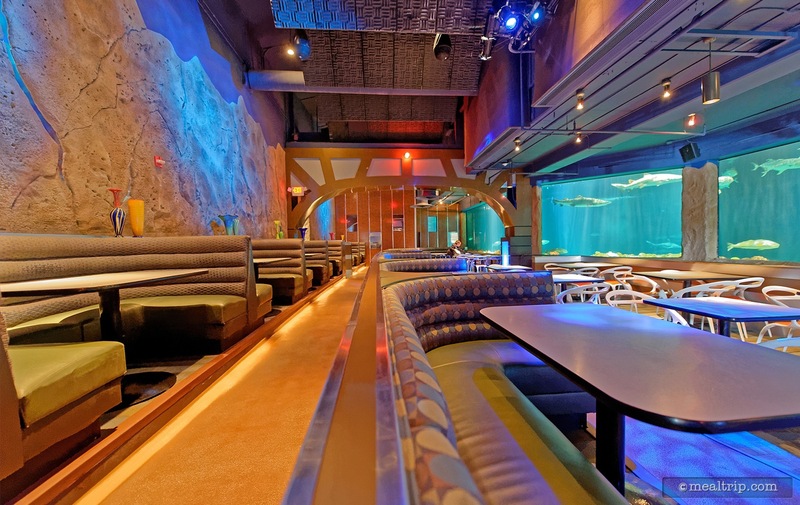 The Sharks lounge area features a bar-top that is also a fish tank. 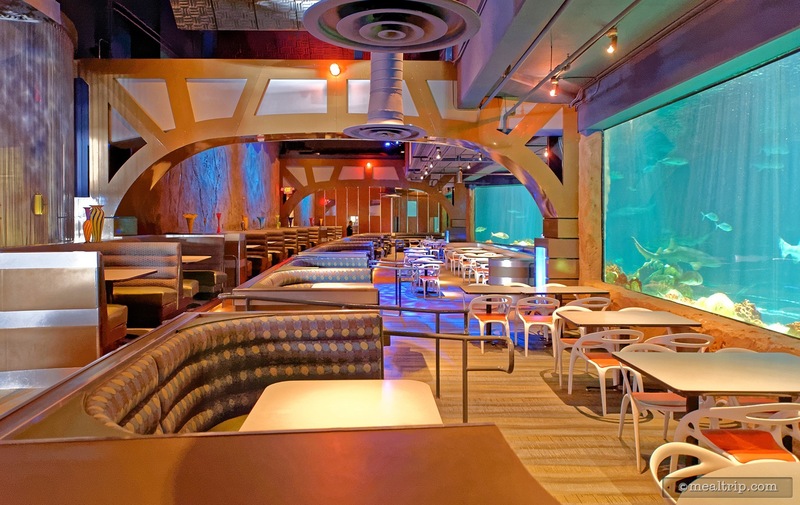 Small fish can swim by and look at you and your drink. 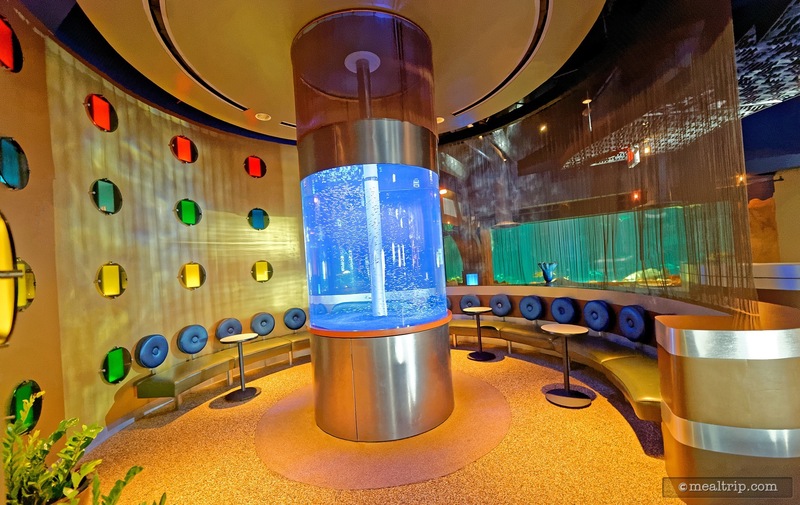 There is also a small lounge area across from the main bar-top area that features this fish-tank column in a rather modern setting. 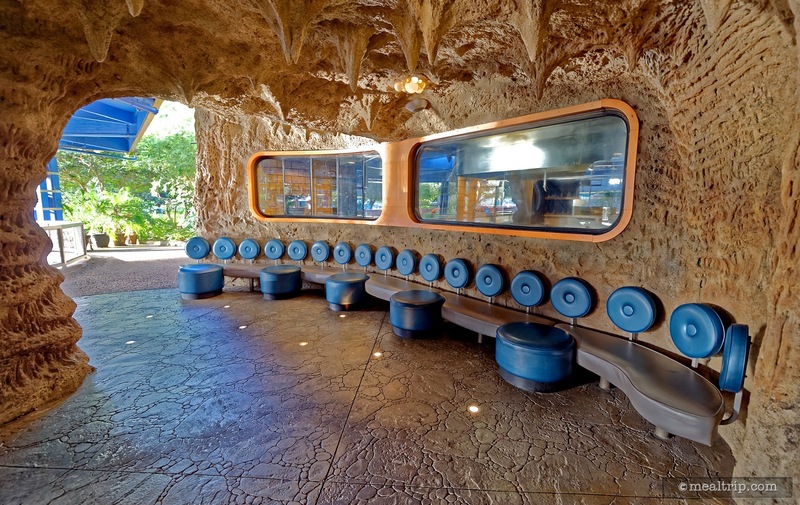 The first tank window as you walk in. Facing north as you walk into the main dinging area. 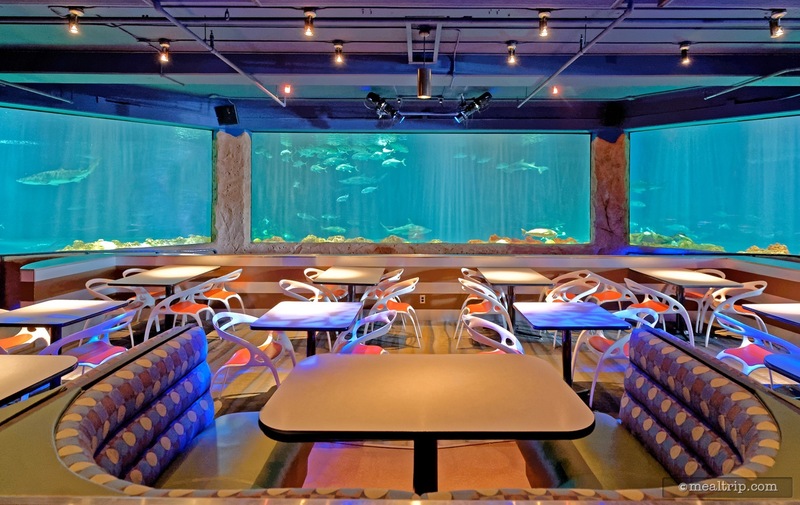 The tables along the wall are elevated enough so that you can get a great view of the tanks, even from the back of the room. Facing north in the main dining area, you can see the various elevations of the three levels, insuring that everyone has a great view. 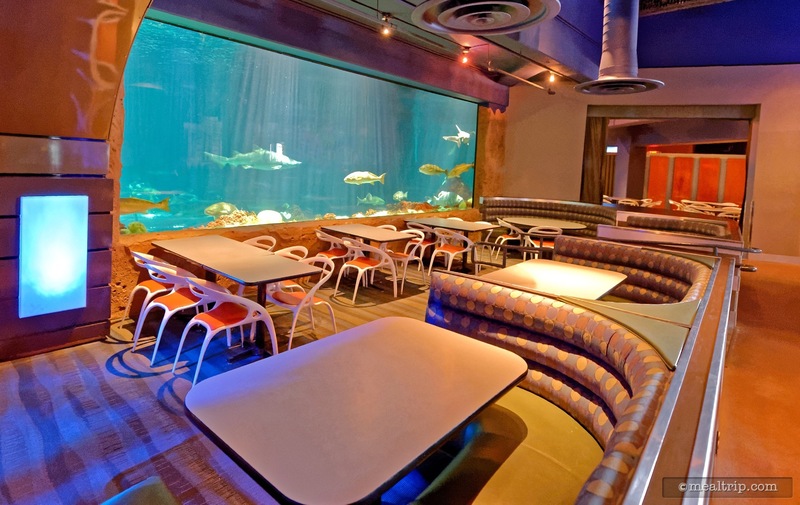 The main tank table at Sharks Underwater Grill. This shot was taken from one of the "wall" tables at the back of the room. Facing north from the middle table elevation. 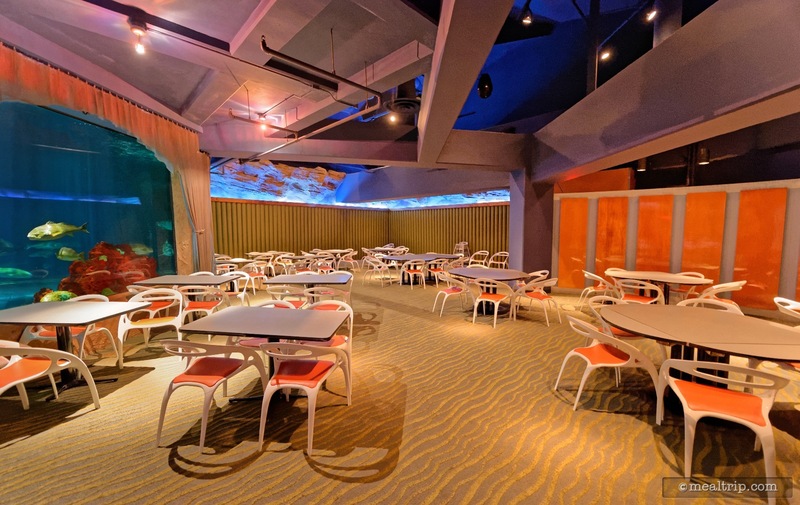 There is a walkway in front of all the tables, that is even slightly lower than the bottom-most table level. 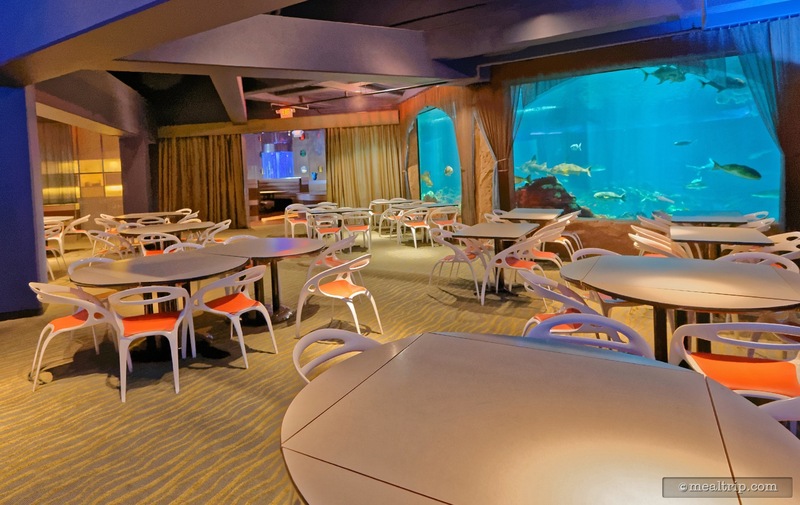 Since you can see the shark tank from most every table, no too many guests spend a lot of time standing in the lower walkway. 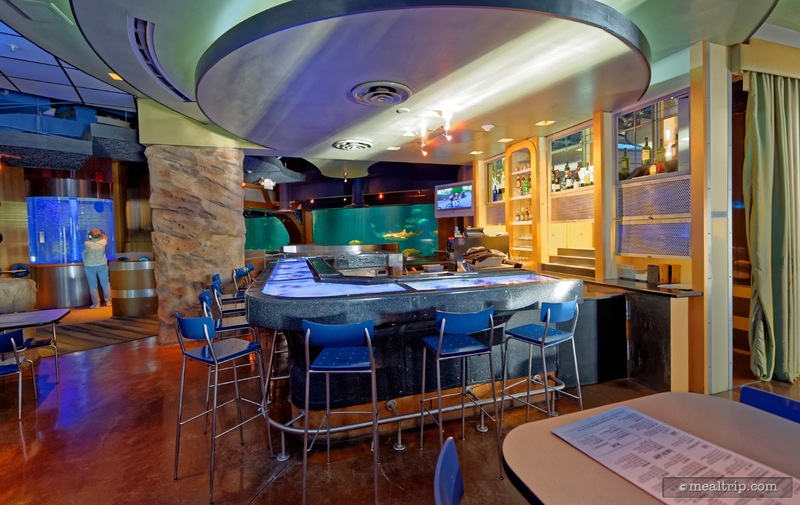 Standing at the far north end of the restaurant facing south (toward the entrance and exit of the dining space). 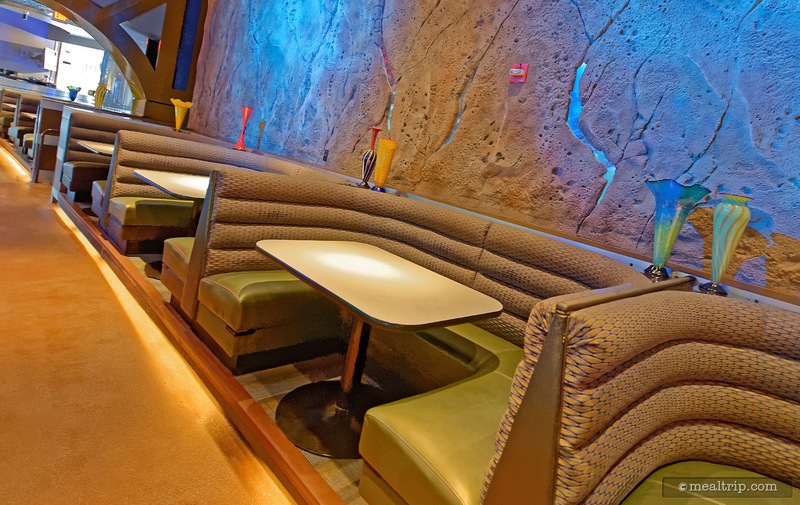 In the far south end of the restaurant, there is a space that could be used for private parties. 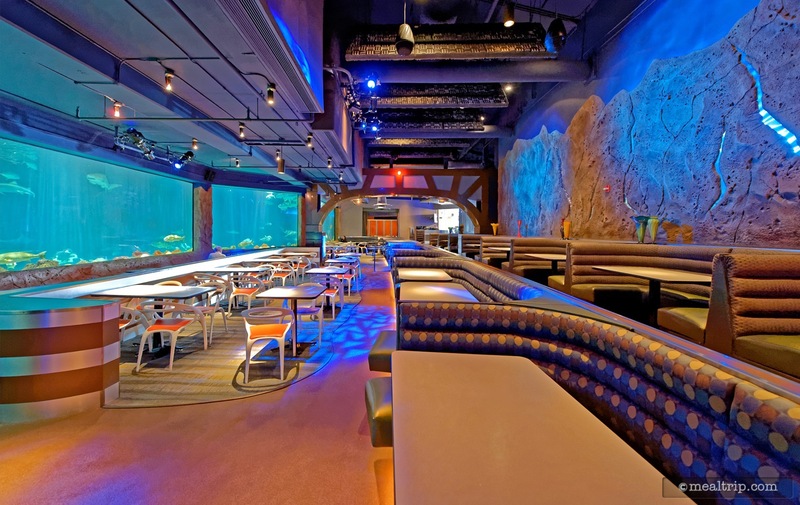 The group event space at the south end of Sharks is flat and level, but still offers great views with a side window looking onto the main shark tank.